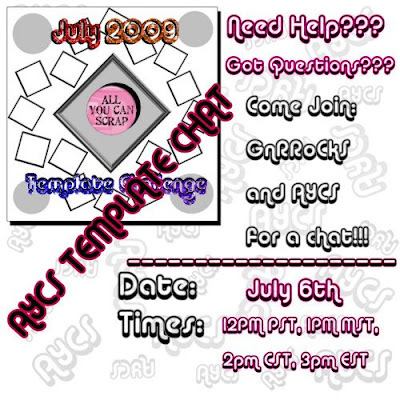 HELRON DESIGNS: Mark Your Calendars For the AYCS Template Chat!!!! Mark Your Calendars For the AYCS Template Chat!!!! Need Help with putting Your Pictures in Templates??? Got questions about Templates??? Come join me-- GnRRoCkS (Misty) While I Host the chat. Mark Your Calendars July 6th 12pm PST...1PM CST...2pm MST...and 3pm EST... Lots of fun. Cant wait to see you there!!! Thanks from AYCS.